You are currently browsing the tag archive for the ‘Emerald’ tag. Today, Emerald underwent a complete restructure of the Development Team. The most obvious result is that there is no specific individual Project Leader – we have determined the best course is to operate democratically and with clear transparency. This series of events has ocurred because of an intolerable abuse of trust. 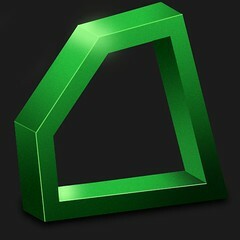 From today forward, Fractured and Modular Systems will have no association with the Emerald Viewer. Due to his own actions, he was left in an untenable position and was given no option but to resign, which he did. For users, we anticipate a smooth seamless transition, however if there is a hiccup or two please be patient with us as we move the viewer to its new home. We ask for your understanding and patience during this time, and ask you to put your trust in this move, as we put our trust into you, the user. The Emerald viewer project and its development team have undergone a massive and necessary restructuring in response to recent incidents caused by the project leader. This restructuring is designed in such a way as to prevent anything like this from ever happening again. From this point on, there will be no ONE single person running Emerald Development. We are all going to be on a level playing field. All decisions, changes, and alterations to any code or anything at all, will be done transparently and democratically. Part of this restructuring process also involved the necessary removal of the developer who is responsible for these past incidents; as a result Fractured was invited to resign and has done so today. As of NOW, All affiliation between Modular Systems/Fractured Crystal and the Emerald Viewer have been permanently severed. A new domain has been purchased and we are currently getting our new website online. The website will be hosted at EmeraldViewer.net and should be online and operational shortly. Ownership and control of the servers used to host the Emerald Viewer downloads and website have been transferred to Arabella Steadham who will maintain the hosting as a neutral party for the project. Aside from the downtime of the website, our users should experience no changes that will affect them directly. Also today, as a result of the incidents in question, Linden Lab removed Emerald from the TPVD. We expected this might happen and have since provided the Lab with information regarding our new changes, structure and goals. We hope to be back on the TPVD soon. Our two biggest regrets are first and for most that these incidents ever took place, and second, that we failed to take this radical action sooner. We sincerely hope that these significant internal changes will help us restore some trust and faith from our users and from Linden Lab in regards to the integrity of the Emerald Viewer Development team. Jessica Lyon, Head QA and Support for Emerald, and Arabella Steadham, Communications Manager for Emerald will be appearing on “Tonight Live with Paisley Beebe” at 6pm Sunday SLT. They will have a rather important announcement to make regarding the future direction of the Emerald Viewer. The Studio itself will probably be quite full, so check your map first and if it is, head for an overflow area. Both Jessica Lyon and Arabella Steadham will be appearing to answer questions, so come along, we look forward to seeing you there! We are thrilled to announce that the former Data Linden has joined the Emerald Support Team. If you’ve ever filed a support ticket to LL and it was resolved to your satisfaction, chances are it was handled by this man. Please welcome Vortex Saito, formerly known as Data Linden to our support team! Welcome to the team Vortex! Two weeks ago, amid an atmosphere of pride and boasting about Emerald traffic, a silly idea was hatched. This idea was to target a blog owned by a creator of a malicious viewer, and boast of the traffic Emerald has captured. The method for doing this was to add links to the Emerald log in page linked to said blog. Each time anyone logged in, our page loaded up and also the other page loaded up – simply to show off our volume of traffic. This was not a DDoS. This was a poor attempt at boasting that failed miserably. Once we discovered this, these links were deleted and the dev concerned was disciplined. The entire Emerald Team offers it’s sincere apologies for concern, panic, worry, mistrust and disappointment felt by our users because of this. I can most strongly assure you that this will not happen again. Following on from yesterday’s news, it is with pleasure that I can now announce the addition of a new member to the Emerald Team. Qarl Fizz, formerly known as Qarl Linden has joined us. We know you will join us in making Qarl welcome, and look forward to his contribution to the Project. In recent weeks, there has been an ever increasing level of hysteria deliberately generated to instill worry and concern into the day to day lives of SL residents. This has involved a concerted effort to confuse the various applications undergoing development, namely the Emerald viewer and Modular Systems projects. “There has been confusion and questions recently about a new initiative some of us are taking part in, that is, the appearance of bots named “Onyx” with the ModularSystems last name. We’ve been silent up until now about these bots, their function, and our goals, because they are still in the development and beta testing stages; however with the flurry of misinformation circulating, we feel it is important to explain what they are for. The purpose of these “OnyxBots” as people like to call them is to identify stolen content much in the same way that users do via the inspect tool. When stolen content is spotted, the time and location, as well an identifier for the content is stored. These are then provided to the content creator who’s work has been copied by email or through a convenient web interface. If no stolen content is identified, absolutely no information is stored. These bots do not record any avatar information, except the avatar key if the copied content in question happens to be an attachment. * The bots would only be comparing content to items that had already been opted in by their creators. * In the event of a detection the creator is notified. * If content was somehow incorrectly detected it would be obvious to the creator who submitted it. * To reiterate: contrary to some rumors, there would not be any ban lists at all, much less global ones. “This post is to address recent blog posts and articles that have appeared concerning the illegal theft and subsequent leak of a database containing some information about Second Life users. In early April, our web server was compromised by a (now banned) malicious viewer developer and several of our server’s databases were stolen. The server in question has been secured and the data loss was for the most part not important. However, there was one database that contained information that these malicious individuals felt it was necessary to distribute, despite privacy concerns. “Datamine” (named such in humor) was a database that was initially created to correlate the IP addresses of visitors to the Emerald Point simulator after several instances of chain-alt griefing. These correlations were created through the use of the standard land media functionality in any viewer. The database allowed administrators to quickly determine if a new account was an alt account of a griefer that had previously attacked the sim. This was originally conceived as a prototype to a now defunct system named ModLink; this system would have allowed Estate Owners greater flexibility in dealing with repeat griefers, most importantly by allowing them to IP ban offenders. After it was demonstrated that this was a effective solution to the problem, several nodes were placed in a few other sims at the request of the owner during a short beta testing period. These nodes were eventually removed, with the last node in Emerald Point removed over a month ago and the database deleted entirely. This situation was the result of a failure on our part to take into consideration that there are really malicious individuals out there, and while the fault is on them for the distribution of semi-sensitive information about other residents without taking into account the effect it could have on those people, the fault is also on us for allowing our security to be compromised. To clarify: All of the data gathered was acquired through the use of land media, there is no relation whatsoever to the Emerald Viewer. Passwords are never sent to our server, they go directly to Linden Lab, and therefore there is no chance that any user passwords could have been compromised. The data was recorded through land media in Emerald Point etc and on our registration portal. The database and associated nodes were removed in April. This system was specific to the sim management by our server’s owner and was not related to Emerald, Onyx, or any other project. This system was created and maintained by a single person. Please, read this at the source here before believing sensationalised articles put about by dunderheaded buffoons. 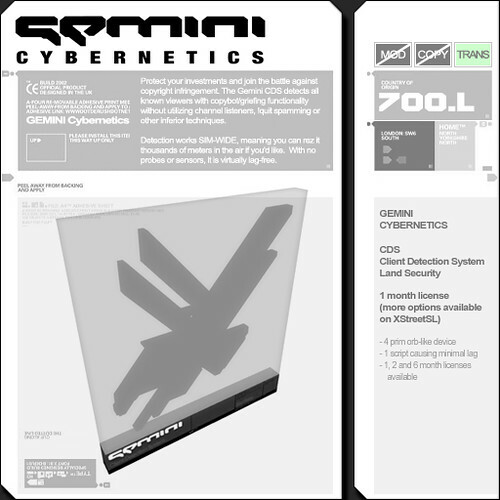 [GEMINI Cybernetics] has released their latest development, the Client Detection System / CDS Ban Relay 1.9 / 1. For those SL users who have now, or at some time in the past, used an illicit viewer, the device is not such a good thing. At last! People will have to be responsible for the consequences of their own actions! Be aware that you may be banned if in the recent past you have been detected using one of the viewers – ‘griefer viewers’ that have been built explicitly for theft, even if you are not using it at the moment you are banned. “While we have been assured by Skills that Emerald will not be identified or banned by the system she has designed and implemented, and we have done our own tests and verified these claims. It would be best however to make it clear that Skills is doing this as an independent venture, and the Emerald team has no involvement or administration capability. We are unable to guarantee that the system is entirely accurate or works as advertised, although we hope that it does as listed. We would like to remind people that only downloads from the official website are official, and downloads from any other source is not guaranteed to be what it claims to be. Please use some common sense when downloading third party viewers, and put a little research into what you obtain, run, and log in on. Just because it says “Emerald” on the download link does not make it Emerald. The Emerald team will not back up or help dispute any claims for the ban system. It is not our system, and we are not involved. Do not come to us. As our virtual world develops, it is exciting to see different viewers created by many talented people. I encourage people to try the different viewers available. Some available are Kirstens viewer, Imprudence, Cool Viewer, and of course Emerald. Linden Lab officially encourages and supports an open platform. You can take a trip to Emerald Point to download Emerald Viewer yourself in world. Our first Asked and Answered panel in a short series entitled “All You Wanted To Know about 3rd Party Viewers and Content Theft podcast ” took place today. Each shared their opinions, thought and experiences and answered questions fielded by the audience. As with many a podcast, a lively debate and discussion began as soon as recording stopped. Many thanks to Malburns Writer for live streaming. And specially thanks to Rezz.TV – Stuart and his crew – for accepting my idea that i brought ti him and bringing it to fruition. This Panel has been convened so that you the user have the opportunity to learn and educate yourself to make an informed decision on whether 3rd party viewers are right for you. The panel will field audience questions as well as Questions on Notice. We are fortunate to have two of the Emerald Development team to answer questions. Also on the panel is Tenshi Vielle, Spokesperson for Artist’s Voice, an educative and information resource for content creators and users. Tenshi will advise on where you can seek information to ensure you are not trapped in a compromising situation. She will also give her perspective on the realities of content theft. Rebel Hope will be here to give her experiences with content theft and the ensuing issues. This Podcast Panel will operate in voice, moderated by Stuart Warf. Questions will also be quite acceptable in text chat on the day. Please come prepared for interesting discussion! 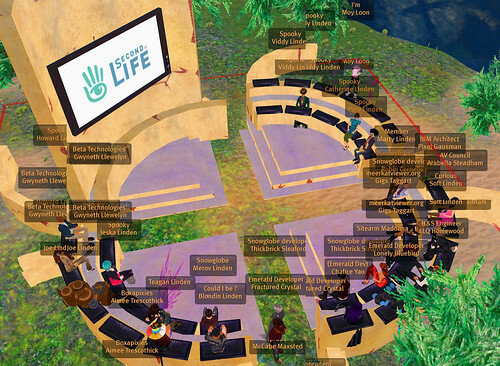 Yesterday, I attended a Lindenlab Brown Bag event hosted by Blondin Linden. 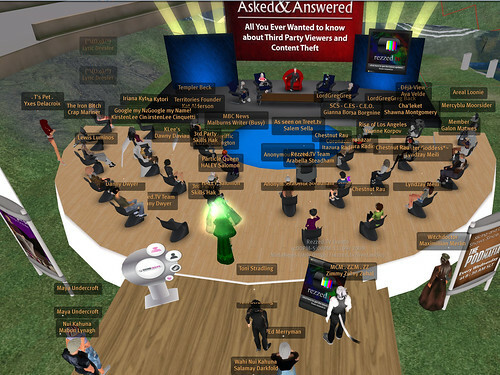 This was an informative Q & A whereby invited attendees could ask Lindens first hand of their issues and concerns. The audio and local text transcripts can be found here as well as on the original blog. I suggest you read and listen to this.